​The Hops ‘n’ Harvest Festivals exist around Kent all year. Just check-out the tourist Office Information centre for more details visitor-information-centre. Plus local Kentish Pubs offer a wonderful selection of beers and we have great restaurants on our doorstep as well! provide good quality, mouth-watering local produce and locally made goods, where shoppers can find genuine Kentish products. They are held around Maidstone in the picturesque villages as well as now in Jubilee Square in the centre of Town in high season. Here in Kent you will find vineyards producing great wines and ciders, such as the Hush Heath Estate near Staplehurst. Visitors are welcome to explore the vineyards, orchards and woodlands through a series of trails and to sample some of the produce from the state-of-the-art winery that has received world class awards and recognition. Biddenden Vineyard is Kent’s oldest family-owned vineyard and produces great wines and ciders. There is also a café and a small shop selling lots of local produce. Leeds Castle. Nominated the worlds most beautiful castle in the World is only 20 minutes drive from us and offers many friendly family days and spectacular entertainment events. Bodium Castle is a moated 14th century castle near Robertsbridge. The Friars Aylesford is an ancient religious house of the Order of Carmelites dating back to the 13th Century with beautiful landscaped gardens and tea rooms and working pottery shed for everyone to see. Local events will be going on and you can visit them with ease if you want to be right in the action. Mote Park is a great local attraction with many events booked throughout the year. Or maybe you prefer something more active and want a go Go-Karting at Buckmore Park! ​Equally, you may prefer to just sit back, relax and enjoy the skyline. ​Country Walks nearby and a Natural Spectacular! ​Relax happily in your warm and cosy accommodation and socialise in the Snug Lounge with log burner for warmth! ​Use the local rambling routes to explore the local countryside and perhaps stop at one of our lovely local Public houses for a warm toastie. The staring point is only a couple of minutes drive away. Equally enjoy the freedom of the outdoors and your own place with the stars, in peace and quiet hot toddy in-hand with our warm fresh & spicy home grown apple juice on site. Enjoy a country walk in Spring with Bluebells all around you. 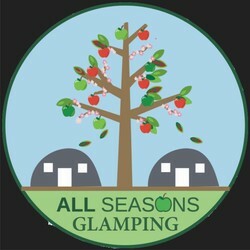 From All Seasons Glamping you can watch the mood changing every day as the seasons unfold in front of you. Whatever the time of year, there is always something wonderful happening around you, or a spectacle to see across the sweeping landscape!